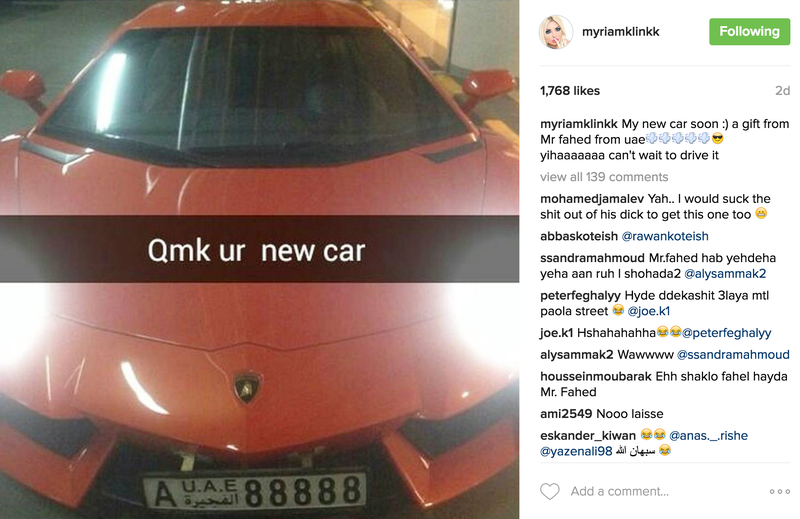 Looks like Myriam Klink's 18+ photos on her newly-launched mobile app have helped her "buy" a brand new Lamborghini. She drives men wild, so it's no surprise that an Emirati fan of the risque Lebanese model-singer bought her a brand new orange Lambo worth a whopping $200 thousand USD. While this is a dream car for so many of us, Myms was not quite happy with her gift. Despite thanking "Mr Fahed" for his generous present and admitting that she "can't wait to drive it," Myriam asked her fans if they knew someone who could paint it pink for her. What a surprise! Myriam complained that she hasn't found a garage in Lebanon that paints cars properly or using good quality paint. She also moaned about the extortionate amounts they charge her to do so. Can you help the damsel in distress?